On growth, economic data, including the unemployment report, have clearly come in better than expected since the most recent FOMC meeting. FOMC practice dictates that progress in economic growth is acknowledged in the statement. Instead, the assessment of the economic environment is verbatim. Had the FOMC given credit to the improved reality, the market might have priced in earlier tightening. The FOMC chose to ignore reality, possibly afraid of an unwanted reaction in the bond market. The chart shows that we have broken out of a 2 standard deviation band and that the breakout occurred at the time of the QE3 announcement. In our assessment, the market disagrees with the FOMC’s assertion that longer-term inflation expectations have remained stable. At best, the FOMC ignores this development because they also look at different metrics (keep in mind that the Fed’s quantitative easing programs manipulate the very rates we are trying to gauge here) or has a different notion of what it considers longer-term stable inflation expectations. At worst, however, the FOMC is afraid of admitting to the market that QE3 is perceived as inflationary. 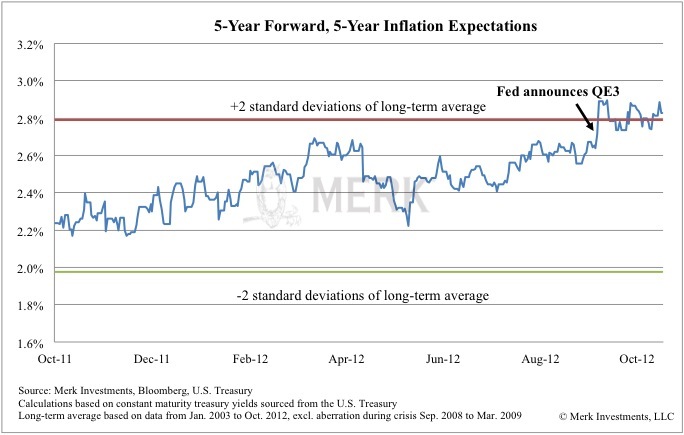 In our assessment, inflation expectations have clearly become elevated. Ignoring reality by ignoring growth and inflation may not be helpful to the long-term credibility of the Fed. Fed credibility is important, as monetary policy becomes much more expensive when words alone don’t move markets anymore. Please sign up to our newsletter to be informed as we discuss global dynamics and their impact on gold and currencies. Merk Investments, Manager of the Merk Funds.